Since Scratch is a graphical language, the print-screen contains the actual information about the program, source text is only a transcription. strs is a vector-style array. delete all block is required to clean it before running program again. repeat is a kind of loop which repeats its body for exactly the given number of times. join is a block which concatenates its arguments. hide hides the avatar (to clean the stage). 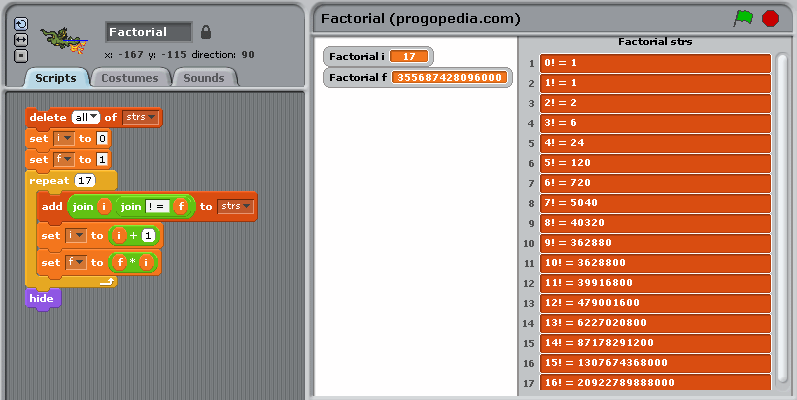 Scratch doesn’t have a standard output as such, neither has it a possibility of “saying” multi-line things. An array was used to output the example results in the required form.